Looking for kinfolk in all the wrong places! As long as I can remember, going back a half a century (and a little more), members of my family were told we were related to someone special. Someone impressive! An ancestor we could all point to with pride and whose blood and DNA coursed through our veins…a noble, historic connection to be celebrated—a legend to pass down and proudly carry forth to our children just as our parents had done. The person was General/Governor John J. Sevier, Revolutionary War hero and first governor of Tennessee, and I am not related to him. His name appeared in family obituaries and wedding announcements. I am not sure how the story perpetuated itself, but I can understand why it happened. Three of my grandparents came from indisputable Irish lineage. Likely immigrants who escaped the potato famine for a new opportunity in America, and who were reviled by existing Americans as the lowest of the low. America today is going through a national, often heated discussion about illegal immigration from Mexico and Central America. It is nothing new. The Irish went through the same thing, perhaps worse, 150 years ago. So I am not surprised that somewhere along the line, my family’s union with the German Sevier branch, contributed in marriage through my paternal grandmother Anna Barbara Sevier, provided a source of great pride for the Irish side. My grandmother was cultured, educated and refined. She would go to her grave, never once possessing a reason to question she was a direct descendant of Sevier. My Irish grandfather could point to his wife’s American blue-blooded heritage and swell his chest with the knowledge that his children were special with a unique link to the Revolutionary War. This special family connection first fueled my idea to explore that heritage for a graduate class called Interpreting the Past. The course challenged our class to delve further into how history is written, to analyze who writes it, and what motivations lie behind the official record. I began to look into my family history for clarification on who I was and the role my distinguished ancestor played in history. Thanks to long hours on Ancestry.com and reading extensive Sevier family trees, I ultimately discovered that the specific and historic Sevier connection had serious missing links. Oral traditions are a legitimate record of history, but that tradition can transform facts into legends. A “collateral” listing somehow evolved into a direct line. Our family claims appear to be based only on a shared last name and wishful thinking conceived long, long ago — claims my grandmother had no reason to doubt, and without the technology available today, difficult to disprove, had she a reason to investigate. I also learned how family legends (BS or blarney, if you prefer) can be innocently handed down as truth, started by an unknown ancestor who wanted badly to be related to this man. It is no wonder our extended family, made up mostly of tradesmen and homemakers, were all too willing to believe the impressive family legend, which we all did in good faith. Accepted as fact, our Irish stock was grafted onto famous American roots, thus giving us a strong connection to America’s past and a reason to feel just a little bit special. The truth does hurt. The Sevier I am related to is not at all famous (though I am proud to say, served in Maryland’s Continental Army). But I do owe the famous one a debt of gratitude. He led me to discover the relative I should have been paying attention to! For once I had exhausted the blank spaces on my father’s side of the tree, I turned toward my mother’s 100 percent Irish branches. The blocks that represent marriages and unions, one generation beyond my grandparents’ informartion, were blank, nameless and unremembered. In order to augment my lopsided family tree, it was suggested that I contact my aunt’s convent for archival information, and indeed, they shared the transcripts of her taped-recorded family history. The archives contained newspaper clippings, magazine articles and art exhibitions featuring the accomplishments of my aunt. The discovery opened my eyes. I had been researching the wrong relative! My aunt’s biography had rested quietly in a manila folder. Meanwhile, her art adorned many walls in living rooms, dining rooms, college hallways, her convent mother house, and museum galleries throughout the U.S. Other eyes have gazed upon her shapes, colors and interpretations. Not mine. Others have had more opportunity to know her through her art. Not me. Others have enjoyed this special relationship with her that I and my family let slip away. All this time I chased a phantom — a famous, non-relative — when here, all along, an amazing relative was within reach; colorful, tangible and a key part of my recent history. I very much want her to be part of my family’s future. My challenge is to reinvigorate that relationship and renew my connection to my aunt — to touch where her brush rested, to plunge into her visual messages and absorb the methods by which she chose to communicate. She whispered in shapes and shouted in colors. I’d like to hear from the owners who have appreciated her artistic efforts. I’d love to know what her art means to you, in what room is it displayed and how does it make you feel? Why did you buy, or how did you acquire, one of her pieces? It is important for me to learn how she has influenced others — what her impact has been, visually, or spiritually, through her artistic expression. This information will help me assess her impact and celebrate her legacy. I am driven by a desire to build her story with words and images. I am curious to explore her past and uncover a story of a unique artist to hand down to my family. I envision a virtual museum of her images that our family, and others, can enjoy, reflect and ponder. For so many years our family chased an historic leading man, and as it turns out, a false connection to our past. The family legend is debunked! But sometimes a treasure is not where you first seek it to be. The heroes in any family’s recent or past history may be someone resting quietly in the background, accomplishing noble everyday feats of bravery, kindness, compassion or talent. They aren’t shouting “Look at me!” “Aren’t I wonderful?” No. They are just great people doing what they do — individuals who deserve to have a spotlight shine upon them now and then, but never ask for that kind of attention. We know who they are. They are the brothers and sisters, sons and daughters, aunts and uncles, first cousin and more distant kinfolk who shape our collective family history. We may take them for granted, or celebrate their life. Pause to consider it all —listen and look. Play their story forward. I discovered a family hero, a little late for my liking, but better later than never. Seraphia Walsh/Sister Mary James Ann may never be as famous as General John J. Sevier and she will never have a statue in the Rotunda. But as my family’s history begins the revision process, she will assume an honored place, and the pages I add will be filled with her contributions, and the testimony of those who knew, respected and loved her. That family legacy is real. I happily relinquish our false claim to blue blood. In its place I joyfully accept the reds, oranges, greens, yellows and blues that coursed through my aunt’s glorious imagination. I am delighted to have received a response from an inquiry to University of Colorado-Boulder where my aunt studied in 1965-66 for her M.F.A. After doing some digging around on my behalf, Valerie Albicker was able to uncover what is titled by her records as Psalm 82:15. My aunt’s CV indicates the title as Blue Psalm- and that may also be a working title. The painting is large: 66″ x 70″ and because it was wrapped in cellophane, the camera captured the reflection and glare. I am certain it is magnificent in person. I looked up Psalm 82 and publish the proceeding chapter to 15. Psalms 82:14 O my God, make them like a wheel; and as stubble before the wind. 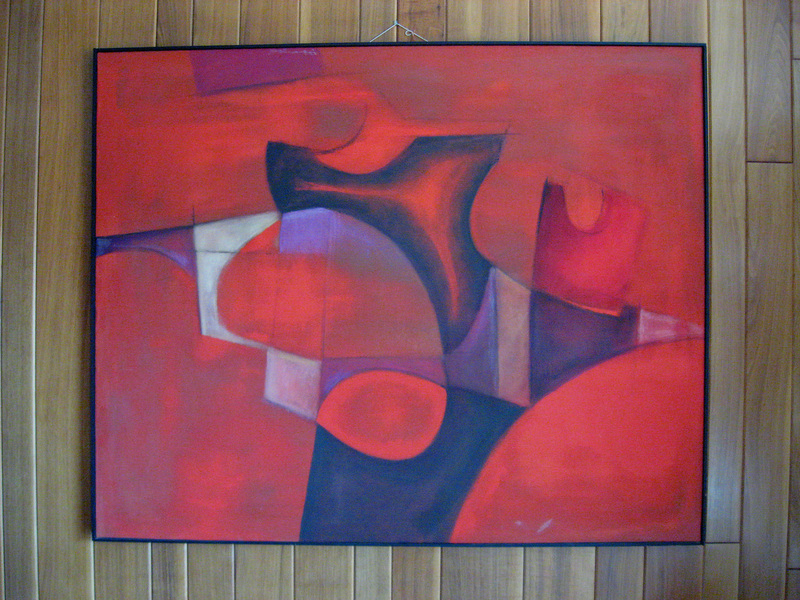 Like many of her later work, reds and oranges dominate. These are intense, bold colors. Colors of love, passion, sometimes anger. Reading the Psalm again, the color of fire is appropriate. I see the hand of God in blue, coursing through nature, sometimes taming the fire, sometimes causing it. I can’t wait to see this in person! I am crossing my fingers at the hint that UC-Boulder is relinquishing some of their surplus artwork that is kept in storage, and that I might have an opportunity to own my first work of my aunt’s. Like my mother did with the Asian paintings, I might have to completely re-design my dining room to offer a proper place of honor for this painting. So many thanks go out to Sr. Sara McAlpin who has spent a good deal of time tracking down more of my aunt’s work. These are very abstract and modern, and I suspect were painted in the 1960s. Not sure what the titles are and if I can scratch any of my missing list! I see people in this picture above…and I see a nun center right.Do you? 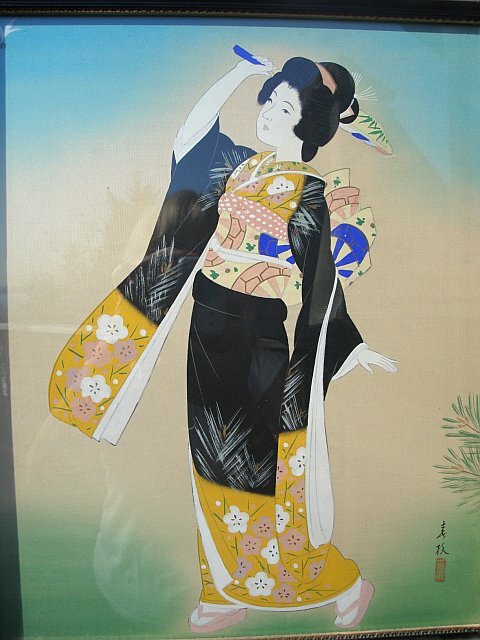 This geisha is one of two Asian-styled paintings that hung in our dining room for as long as I can remember. It is older than I am. I have a picture of my mother pregnant with me and the picture hangs on the wall. My parents married in 1947 so perhaps these were a wedding gift, I am not sure. The other is of the Madonna and child, in a similar style and I am waiting on my sister to send me a photo. The geisha belongs to my brother – thanks to my sister in law for taking these photos. Detail of her signature stamp…cartouche? Madonna and Child, painted prior to 1955. The calligraphy is the "Hail Mary"
Someone on Flickr told me this was the Hail Mary, written in an old Chinese calligraphy style. These two images were the family heirlooms of my aunt’s work. Two paintings, three children – I drew the short straw! But I can see them whenever I want. What I find most curious is her evolution as an artist. These early examples are excellent examples of technical proficiency. 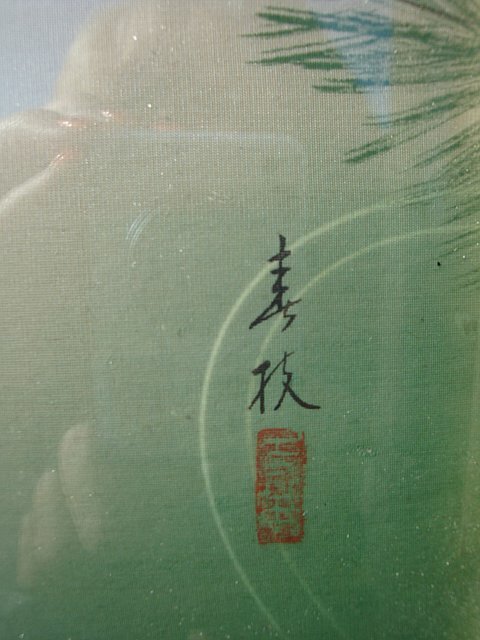 My aunt was a very talented calligrapher and her personal handwriting was always unique and artistic. 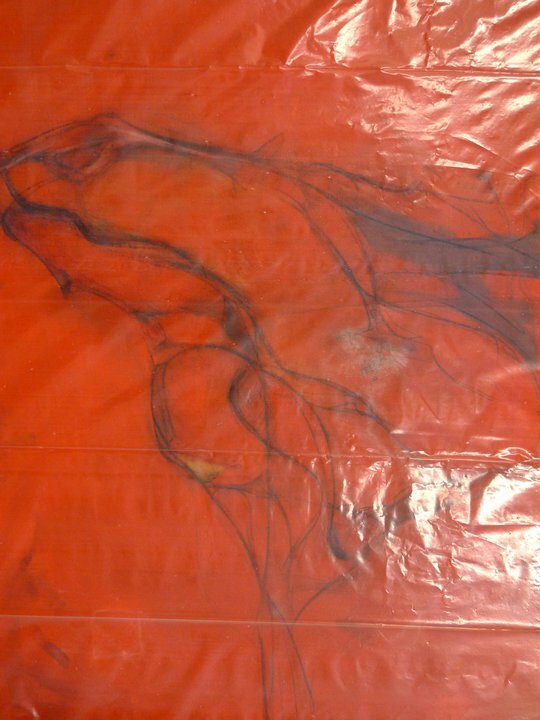 I’ve never painted on silk, but I suspect it is not an easy medium to work with. I imagine these two works were done while she was obtaining her BA, and I have speculated that my mother may have gotten them as a wedding gift. They were centrally focused as my mother’s romance with Asian decor grew and evolved. 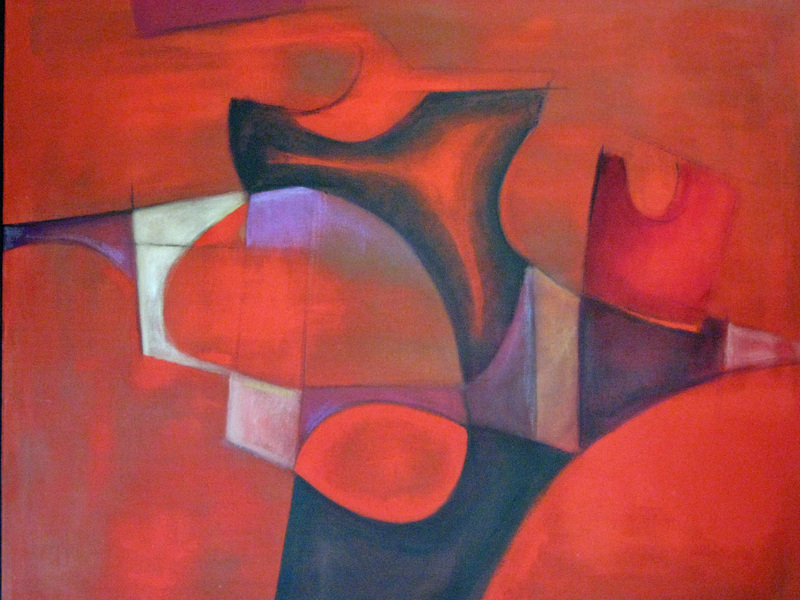 As my aunt matured, learned new techniques and earned two additional graduate degrees, her confidence to explore and express beyond traditional artwork grew. As she became exposed and influenced by modern masters, as she encountered young creative students in the 50s and 60s, as her religious order became more modern after Vatican II, as America and the world were experiencing social revolution and war, as she traveled to Europe and exhibited and received feedback and sold her own collections – all of these factors and conditions surely contributed to her change of style and interpretation. Her journey must have been so much fun and very stimulating! I am so glad she took it! I have seen many artists stick to a visual formula – to a look that sells – to answer to tastes and popular demands -and stay there. That is boring. My aunt was never in it for the money, obviously. She lived a life of extreme modesty. No, she took chances because she wanted to- she pushed herself because she could- because she was curious and artistically inventive. Socially, she lived a conservative life – painting seems to be her outlet. Not that she wanted to go wild or was repressed, but rather she challenged herself to find new ways to express traditional values – love, spirituality, God, as well as artistic form, structure, shape, design, etc. It looks as though the author, affiliated with The University of Duluth, Minnesota and the Tweed Museum of Art, mentions my aunt and a painting done by her: Iron Crosses, Bruges. 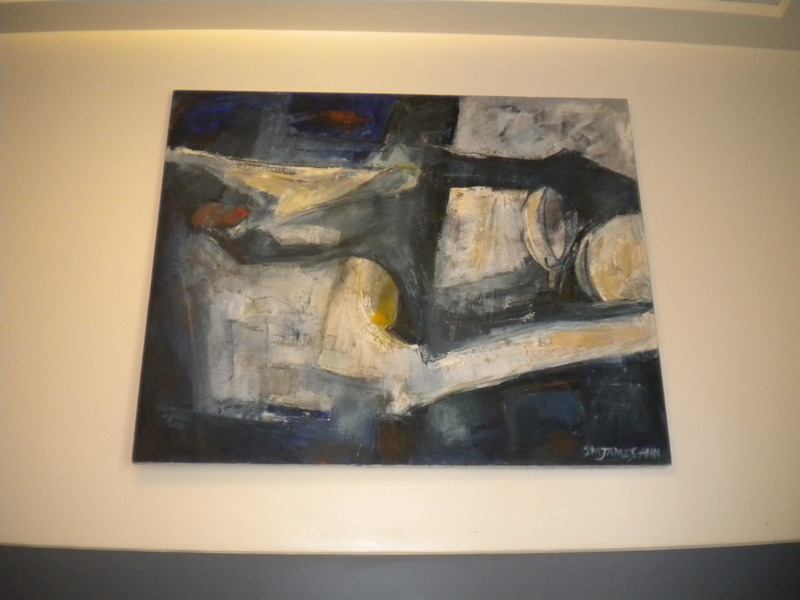 Apparently Mr. Richard E. Nelson has one of my aunt’s pieces in his home. Now I need to get a hold of him!!! 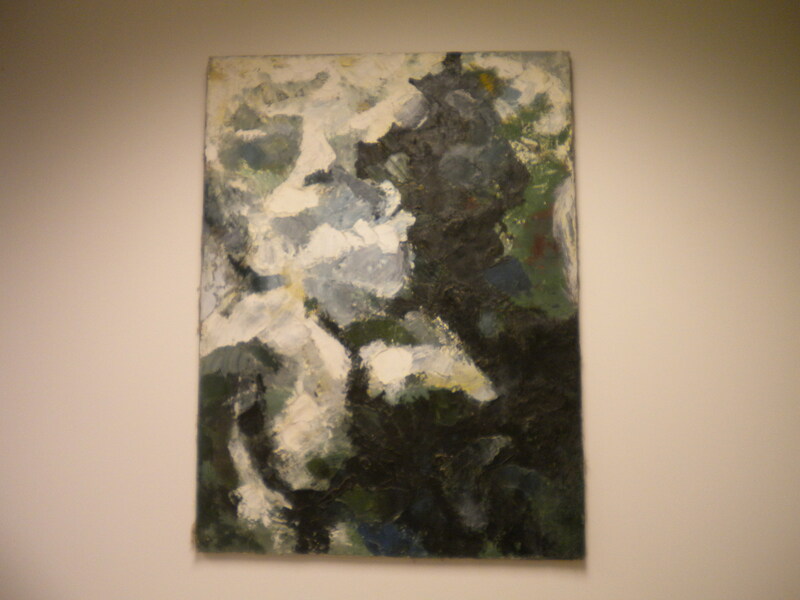 New painting discovered – 1966!!! My Craigslist contact came through! I am so excited! 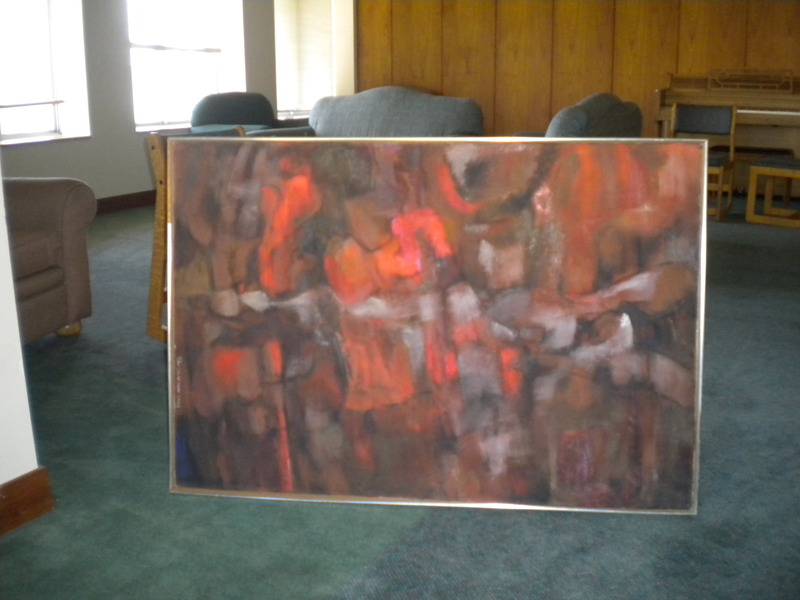 I’ve been corresponding with a woman in Dubuque whose father purchased this painting in 1966. He believes it was painted that year. He also told his daughter there was one similar in green that he liked. This is untitled. It appears to be acrylic. Fortunately the family has a relative who is an art curator so some more information and a good cleaning will be forthcoming. I am indebted to this family…we have reached across the Internet…Dubuque, Iowa and Lewes, Delaware!!! The first of many I hope! I understand the painting is signed but photo did not render this visible. It has been exposed for 34 years so I agree with my new friend that it probably could use a cleaning. It appears to be acrylic and very large, as most of her paintings during this time are. 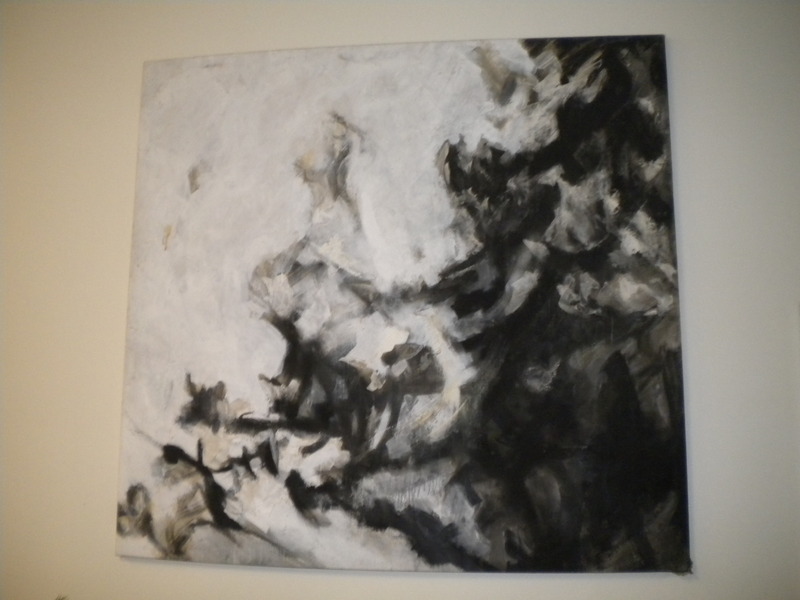 I am thinking that these abstracts were painted after she received her M.F.A. from University of Boulder, when she attended in 1965-66. I am hoping to find out what courses she took there…her style seems to have shifted to very strong abstract after her graduate studies in Colorado.